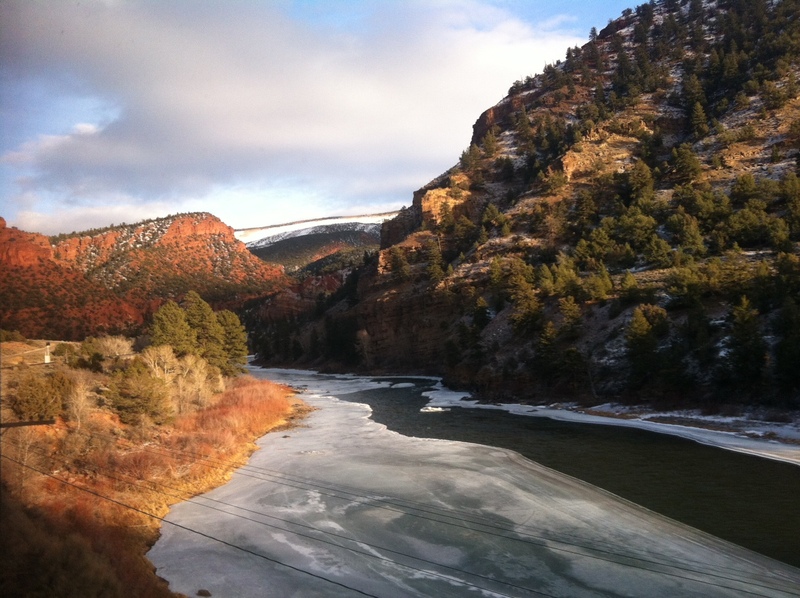 Photos from the Amtrak’s California Zephyr can be viewed here. I’ll call it one of the ten best steaks I’ve ever eaten. Medium-rare with herb butter, a baked potato, and green beans. A dinner salad and warm bread rolls accompanied each dinner entree. Crab cakes, ribs and sea bass were the other choices. Just as flavorful was the dinner-time conversation. At my table sat a man from London, a woman from Vancouver, a professor from the University of Utah who moved to Utah in 1969 from Chicago, and myself. Perhaps you can imagine the wonderful political and social debates that emerged from this group – all in good humor, of course. I think our table was the envy of the dining car because of the amount of laughter as well as solid discourse that came from our foursome. With dessert and coffee we prolonged our conversations until we had arrived at the Denver station. During our time together we learned why our train was late. The night before, the inbound train that made up our outbound train was hit by a rock in the canyon just outside of the Moffat Tunnel. Quite a large rock, in fact. So large that when the rock hit the Amtrak locomotive, the locomotive leaned enough for one set of wheels to come off the track. I was in bed by 10:00 pm and I didn’t wake until we had departed Lincoln, Nebraska at 6:15 am. It had been a good nights’ sleep, though I always sleep well on trains. It’s the gentle rocking that occurs when not being hit by falling boulders. I freshened up downstairs before breakfast and was delighted to have the professor join me again. It was just the two of us so we debated the brands of political corruption in Salt Lake and Chicago, neither one being declared superior, though both brands being declared equally effective. We finished breakfast by the time we passed through Council Bluffs, Iowa. Now we’re heading east through Iowa and still behind schedule. I suspect I’ll arrive in Chicago right around the tail end of rush hour. Once home I’ll post a link to Flickr where photos from the trip will be visible. I opened the curtains this morning at 6:15 am expecting to be somewhere close to Denver. Instead I saw flat land. Prairie. My map showed me that we were still in western central Nebraska, hours away from Denver. While I was sleeping the train stopped, and apparently more than once because from what I could calculate, we were behind schedule by a few hours. As the sun began to light the morning sky prior to it’s rise over the eastern horizon I decided to make my way to the dining car. Breakfast seating began at 7:00 am. Pancakes or French toast, scrambled eggs or as I chose, a Swiss cheese omelette with potatoes, bacon and a warm croissant. The woman with whom I ate dinner last night sat down at my table just as I was finishing up. When 8 am arrived the conductor made his first announcements of the day, stating indeed, that we were now about four hours behind schedule due to freight traffic during the night. Our travel thus far has been on rails owned by Burlington Northern and their controllers give priority to their own trains. The railroads were initially built to connect the country, thus bringing people and goods to a nation that was expanding westward. You may recall from history books that the government gave land to private companies on which they were chartered with the business of building railroads. While there was income to be made on transporting people and goods, there was even more money to be made from selling off the land that adjoined these new railroads. The railroad magnets of that era were creating their fortunes off of a government subsidy – that being the land itself. The model worked and thus the country became connected from sea to shining sea. Fast forward to the late 1960’s and the railroads began to discover that carrying people wasn’t as profitable as it once had been, in part because of mismanagement and in part because people started traveling by cars built by yet another private industry, though enabled through the huge government subsidy known the Interstate Highway System. The shifting of government subsidies, from the giving of land to build railroads to clearing land to build highways, shifted public demand and passenger traffic on railroads nearly evaporated. Amtrak was created by Congress in 1971 to maintain the intercity movement of passengers via rail, though the government continued to subsidize the construction of freeways, airports and of course, oil. This model worked to produce new industries which created tremendous wealth for many millions of Americans. Things began to change again in the early twenty-first century. The country’s population had grown rapidly. The aging and now underfunded Interstate Highway System was over capacity and beginning to crumble. The cost of securing oil through military use became increasing more expensive and created political strife. The Untied States was no longer the only industrialized nation and we were competing for the purchase of oil, thus driving oil prices even higher. Today, due to shrinking federal funds the systems that were built by federal funds are unable to keep up with demand. Now we have to rethink where and how to invest – to make sustainable public investments so that we don’t run into these types of problems again. The reason my train is now four hours late is because Amtrak does not have dedicated track. Dedicated tracks aren’t necessarily required, but modern train tracking equipment is, though the private railroads are reluctant to spend the money to increase efficiencies that don’t necessarily benefit them. Airlines don’t have dedicated runways, but they do have a system in place for the fair (some may question that) and equitable use of air-traffic facilities. It’s known as the Federal Aviation Administration. My train could even go faster too if the engineer wanted but private railroads have not maintained their tracks to sufficient levels to sustain higher speeds. So when you hear politicians talking about how inefficient Amtrak is, they’re only partially correct. Amtrak is efficient as it can be because it is being throttled by private industry. Additionally, while the federal government continues to build new highways and new runways, it is not building new railroad tracks. Other nations are, however, because federal dollar for dollar, passenger travel by rail remains the most cost effective method of moving people. My 1038 mile journey to Denver which on Amtrak has taken thus far twenty-one hours would have only taken five to seven hours on a 200 mph modern train like those in France, Germany, Japan or Korea. Critics are correct when they say that people will not travel long distances on trains because of time constraints. Critics will also say that if passenger rail travel were profitable, private industry would build it. They are also correct. And if General Motors had to build the Interstate Highway System and if Delta Air Lines had to build airports and runways, both companies would have vastly different business models. Despite the critics, Amtrak is seeing steady year-over-year increases in passenger boardings. Yes, the scenery is beautiful. Yes, the seats are more spacious than on an airplane. Yes, train stations are less congested and less burdensome than airports and yes, maybe it is that now that the largest segment of the American population is retiring with the largest amassed income ever produced, these people may very well be the driving Amtrak’s business. Our tax dollars build industries. They always have and when you hear politicians say that they can’t or shouldn’t, they’re wrong. Look around at what you have and a vast portion of it has come because the government subsidized an industry that supports you, or pays you. I will agree with the politicians that funding inefficient industries and/or projects is wasteful. Which is exactly why government needs to invest in passenger rail because it is inherently efficient with land use, fuel, speed and capacity. My train has just arrived in Denver. Exactly four hours late. The engineer announced that he’ll try to make up time as we head to Salt Lake City. For the remainder of the trip, my train will be using tracks owned and maintained by Union Pacific. Walking into Amtrak’s Metropolitan Lounge at Chicago’s Union Station reminded me of walking into a nursing home. This isn’t the hip new pre-departure lounge at Heathrow’s Terminal 5 or Finnair’s Blue Wings Lounge at JFK. The people here, rather, looked as if they’d collapsed into the furniture that had been placed along the walls. Mostly everyone had grey hair. Baggy corduroys and sweaters seemed predominant. Unlike a chic airline club where one might catch up on the business or political news of the day the television in the Metropolitan Lounge was tuned to the Maury Povich Show. Is this really what wealthy retirees watch? It’s not unreasonable to determine that based upon the time requirements of cross-country train travel few people other of retirees have the luxury of spending three days on a train just to get to the west coast. Add to that the additional cost of sleeping accommodations, and well, that’s the generation that has all the money. Not unlike the challenge once faced by Cadillac, Amtrak is going to have to find a way to attract a new demographic for their premium services because within ten years, this group will be dead. Like Cadillac, Amtrak will have to add speed and new technological advances to accomplish this. 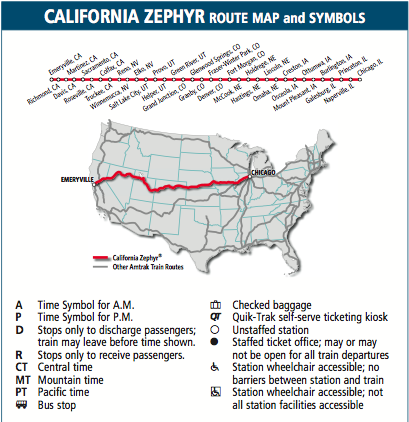 Soon, however, boarding was called and those of us scheduled for the California Zephyr were escorted to Track 12. Our attendants greeted us at the door and gave us directions to our rooms. You may have heard that Amtrak just placed a multi-million dollar order for new rail cars, some of which will be Sleepers. My car is evidence of this need. While there’s absolutely nothing wrong with my car or my room, its age is noticeable. The carpet is tattered. The washroom on this floor has layers of sealant around the basin and commode. Fixes made to bide time. For some reason the electricity goes out each time the train stops, which is both at stations as well as when we’re waiting for freight trains. While Amtrak has the right to travel on private rails (which were initially built on land granted from the government to private industry), freight trains get priority. In the aisles and in my room the overhead lighting is dim and the plastic globes appear dingy. The “adjustable” reading lights adjacent to each of the two seats in my room don’t adjust much. If you happen to be acquainted with the flight attendant jump seats on an L-1011, you’ll get the picture. A call button and the adjustments for the heating controls are within the same unit. The train departed on time and shortly thereafter the conductor came by for tickets followed by my car’s attendant who introduced herself and told me about the trip and the amenities available. A coffee station at the top of the stairs is always on and a cooler of water and juice sits nearby. A few minutes later an attendant from the dining car came by to inquire about dinner reservations. I reserved a spot for 5:30p. The dinner selections offered something for everyone. Steak. Chicken. I chose crab cakes with rice pilaf. Hot bread and a small salad were brought by first and there was nothing second class about either. Crisp lettuce with cucumber and tomato with an assortment of dressings. The crab cakes were delicious. My dining partner had the sirloin with a baked potato which she found to be equally delicious. Sugar-free cheese cake with raspberry sauce and a black coffee for desert, though I could have opted for carrot cake, a variety of ice creams or some chocolate temptation. My attendant said she’d be by at 8:30p to make up the bed. That’s hours before I’m used to being in bed, though with the gentle rocking and utter darkness of the Iowa plains outside my window I’m sure I’ll fall asleep easily. My room is warm, comfortable and quiet. It is the perfect place to relax. On Wednesday the 18th I begin a day and a half journey that I’ve been waiting years to experience. 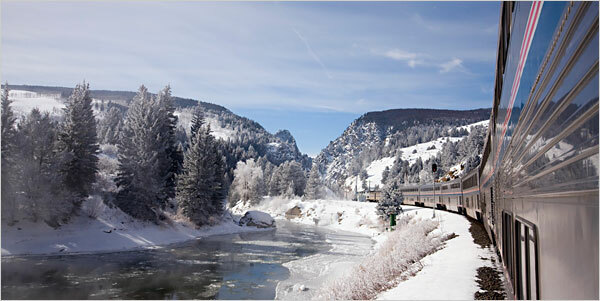 It’s said to be one of the most beautiful American journeys, particularly during the winter months. It is the Amtrak ride through the Rockies to Salt Lake City. The trip is scheduled for thirty-four hours each way. By Thursday morning at 7am the train is scheduled to arrive in Denver. After an hour in Denver the train begins its ascent into the Rockies and arrives fourteen hours later in Salt Lake City. Only half of this portion of the trip will be during the daylight hours, and I intend to be glued to the windows, either of my room or in the observation car. I suspect there will be plenty of competition for seating in the observation car. I’ve reserved a sleeper car for the trip, paid for with Amtrak points I accumulated during my commutes to and from Ohio prior to the move to Chicago. While Amtrak’s coach-class seating is ample for a journey such as this, and very reasonably priced, being able to sleep in a bed and having access to showers and complimentary meals in the dining car seemed to be a more comfortable way to go about the journey. I’ll attempt live updates from the train, be that on the blog or via Twitter. Data coverage will be spotty at best as this segment of Amtrak does not offer Wi-Fi service. I look forward to sharing this trip with you. The entire trip will be completed with the use of public transportation. From my flat in Chicago I’ll travel by bus to Union Station, board the train and once in Salt Lake City I’ll have access to the Utah Transit Authority’s buses and trains.